I did not believe Jim when he said the Glen-Mor Restaurant served spaghetti and meatballs since it is definitely not a typical New England recipe. But he produced an old copy of a Wednesday night specials list and proved they served it once a week. Though it may not be a New England specialty, the Glen-Mor made wonderful meatballs, and this recipe makes enough for leftovers to freeze for later. Preheat the oven to 425 degrees-F. Beat eggs, parsley, oregano, salt, and pepper together in a large mixing bowl. Mince the garlic clove. Add minced garlic, cheese, and bread crumbs to the egg mixture, stir to combine. Cut off bread crusts and discard. Soak bread in a bowl with the water for 3 minutes. Squeeze water out of bread and add to meatloaf mixture. Incorporate with hands until well blended. Drizzle olive oil on 2 cookie sheets with sides. Use an ice cream scoop to portion meatballs, approximately 24, placing meatballs on the cookie sheets. After dividing all of the meat mixture, roll each portion into a smooth ball, some of the olive oil on the pan will help to make the meatballs smooth. 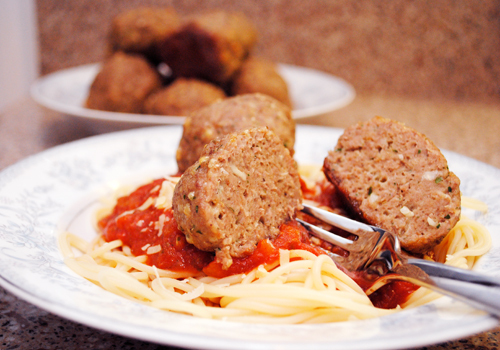 Bake meatballs for 15 minutes. Serve with Tomato Sauce and spaghetti noodles.